The OpenVario has no built in GPS reciever, so it is necessary to connect – at least one – external device, which provides NMEA GPS data in RS232 level. In Europe, the Flarm collision avoidance system is widely-used, which can send GPS data and also traffic information to the OpenVario. 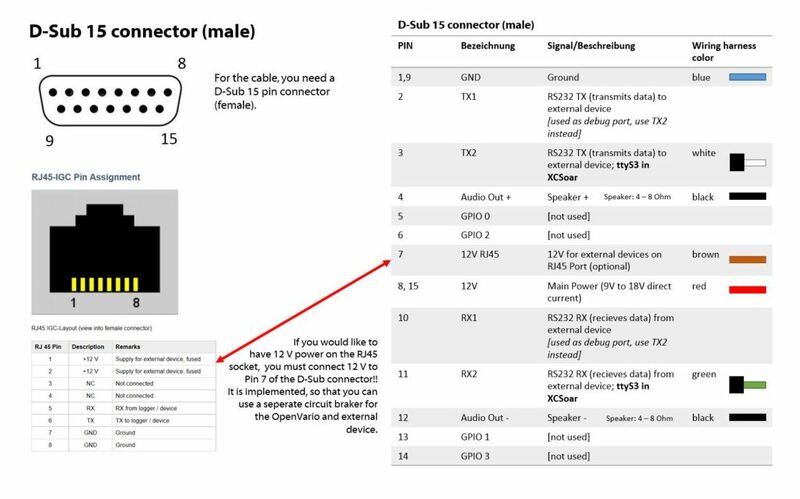 Also the connection to the OpenVario is straightforward, because you can use a 1:1 pin assigned RJ45 cable. But there are plenty of other devices available on the market, which can be connected to the OpenVario system: flight recorders, standalone variometers, radios and even a second OpenVario for a doubleseater configuration. In this blog post, we will discuss the mechanical wiring as well as the software settings in XCSoar. The SteFly OpenVario has two serial ports with a RJ45 connectors and two serial ports at the D-Sub 15 connector. 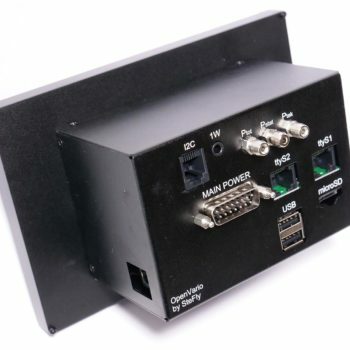 All ports are RS232 with 12 V level and the only difference is the connector type. Please have a detailed look at the following pictures. There is a IGC pinout standard available for RJ45 sockets, which is commonly used for Flarm devices and (older) flight trackers. 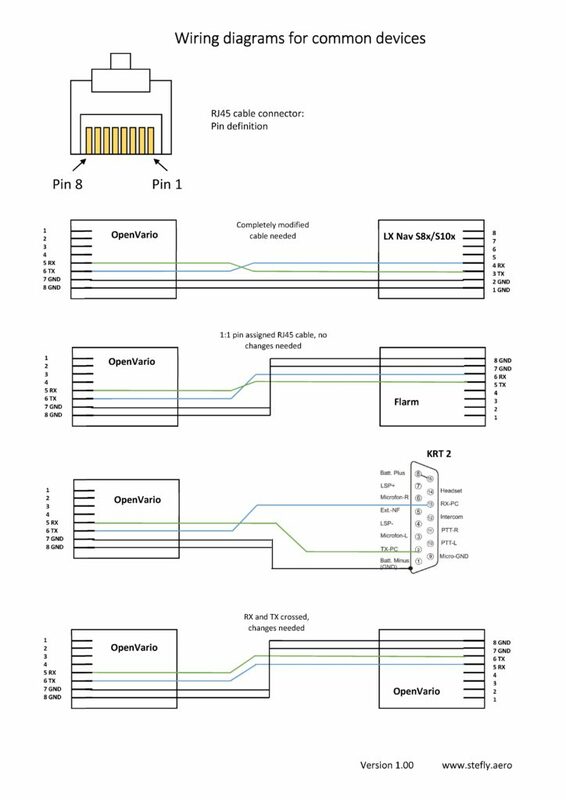 The OpenVario also uses this IGC standard, which enables a straightforward installation of Classic and Power Flarm devices with a 1:1 pin assigned RJ45 cable. Unfortunately not every manufacturer is willing to use this RJ45 IGC standard and therefore it is very important to check the manuals first. 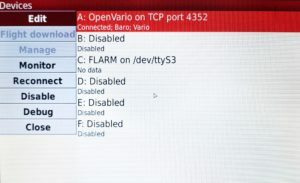 You may damage your OpenVario or external device, if the pinout is incorrect!! We are not responsible for any damage! The following picture includes the most common serial cables. After achieving the physical connection of the external device, you need to setup the software. First of all, you need to power on the OpenVario and let it boot into XCSoar. Hit the menu button (M on Rotary Module or Remote Stick; F1 on a USB Keyboard). Enter the Device menu. You can navigate with the joystick on the remote stick, with the encoders on the Rotary Module or use the arrow keys on a USB Keyboard. Hit return on the Keyboard or use the center push button of the Joystick/ Encoder to enter the device menu. As you can see in the screenshot above, you have the option to configure 6 different devices in XCSoar. Device A has the highest priority. If a higher priority device does not provide specific information or fails, the next lower priority device will be used to feed XCSoar with data. If you have no pressure sensor unit installed, you can disable or override Device A. To navigate in this menu, you can use the arrow keys and return (or the equivalent keystrokes on the input devices). But it may be easier to use a USB mouse for the basic setups on the ground. Connecting the Flarm is relatively easy when you know exactly to which port you connected the Flarm (ttyS1 or ttyS2 when connected to RJ45; ttyS3 when connected to D-Sub) and at which baudrate the Flarm sends data. The baud rate of the Flarm can be configured in the Flarm device. Please have a look in the manual of you Flarm device. If you don´t know the baudrate at which the device is sending data, you can try all baud rates in XCSoar. You can also use the monitor feature in this menu, where you can see the NMEA data stream. If you have selected the correct baud rate, you will see a readable data stream. With a wrong baud rate, you will only see random numbers and letters. After selecting the correct Port, Baud rate and Driver, hit OK. Now you should see, that Flarm is connected. For connecting the KRT2 radio, we can recommend to use ttyS3 on the D-Sub connector, because you will need to build a custom cable. The baud rate of the KRT2 is 9600 and not changeble. Connecting LX Nav or other standalone variometers to the OpenVario is also possible. Make sure to use the correct cable! The baud rate at LX Nav S8x & S10x devices is configurable. Please have a look at the manual. It is also possible to use two seperate OpenVario devices in a doubleseater. In this setup, you only need one pressure sensor unit and can connect both devices with a serial crossover cable (see schematics at the beginning). 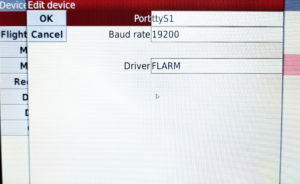 Usually all serial devices are connected to the front OpenVario unit and then the complete data is forwareded as one NMEA data stream to the back seat device. On the front seat, you declare one port as NMEA Output and keep in mind the baud rate e.g. 19200. It is possible to use a FUNKE radio if you dont have a KRT2. You can send the airport freqvenses from OV to the radios as a standby or active freqvency.